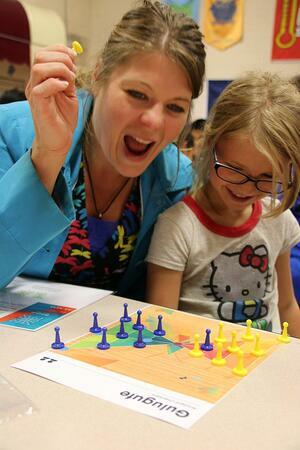 On a cool, stormy night, when most families choose to stay at home, over 280 parents, students, educators and volunteers flocked to Grandview Elementary School in order to experience a night of math, games and learning at MIND’s first Family Math Night in the Detroit region! 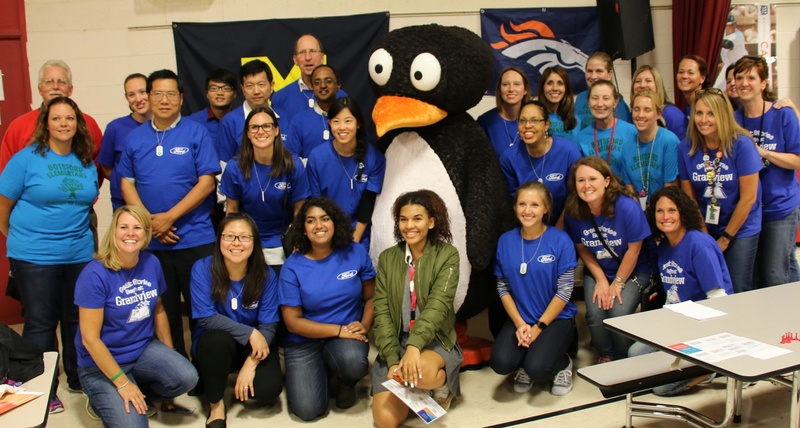 Families from two ST Math grantee school communities, Grandview Elementary and Botsford Elementary in the Clarenceville School District, gathered together and joined teacher volunteers, MIND volunteers, the real-life JiJi, as well as volunteers from MIND’s sponsor, Ford Motor Company. 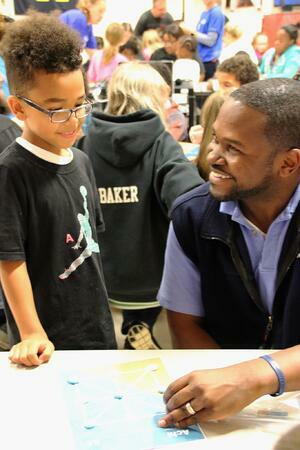 Grandview Elementary hosted Family Math Night with Ford Motor Company and MIND Research Institute. Participants enjoyed an evening of connecting with one another through a variety of math-based games designed to encourage conversation about math and enhance math learning. Everyone can be a mathematician! The overall goal of MIND’s Family Math Night is to provide a venue for students to demonstrate their math skills to both parents and peers outside the classroom. It brings together families, participating school teachers and administrations as well as the volunteer community in a fun, relaxed and positive environment. These types of opportunities are important to bring communities together to help increase STEM education awareness, learning and experiences. Ford Motor Company understands the importance of preparing today's students for the 21st century workforce with a specific focus on STEM skills. 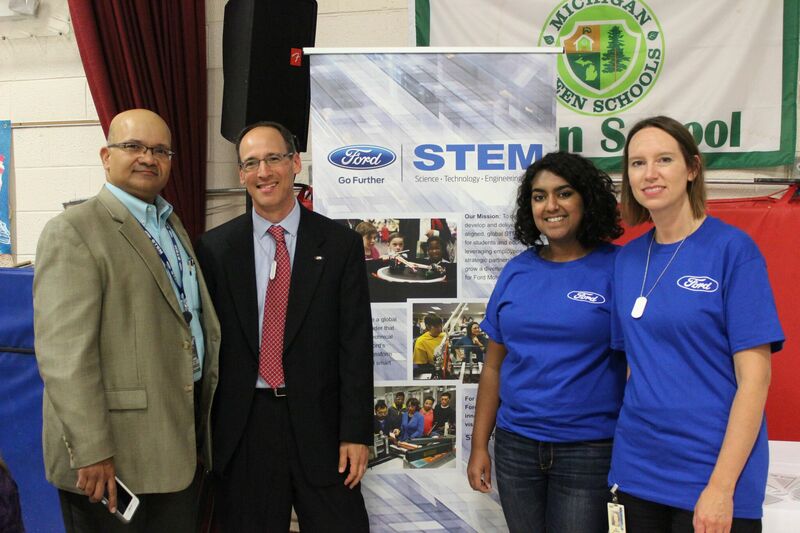 Supporting STEM education creates opportunities that connect Ford and its employees directly with youth and the community to foster future talent for the automotive pipeline. “There is a need to grow talent in the STEM field,” said Prashant Javkar, STEM Strategy and Programs Manager at Ford Motor Company. “Outreach to K-12 students is critical because it introduces students to STEM programs and encourages them to consider a career in the field.” Ford has a number of STEM programs and it most recently teamed up with MIND Research Institute to support the ST Math program in the Clarenceville school district and the September 28th Family Math Night. Alan Jacobson, Director of Global Data Insight & Analytics at Ford Motor Company, started the evening by sharing his experiences with how problem-solving has been webbed throughout his career and personal life. As an engineer participating in the F-Series, Expedition and Navigator launches, playing and coaching soccer, and serving his community as a medic and a firefighter, Jacobson always had a passion for problem-solving! Alan earned his bachelor's degree in mechanical engineering from the University of New Hampshire and a Masters of Engineering at Virginia Tech as an IBM Fellowship recipient. He knew early on the importance of STEM education, problem-solving, grit and perseverance, reflected in the multiple leadership positions he has had over his twenty-plus year career at Ford. "Math is a key foundation that has allowed me to pursue this diverse career – and it’s the foundation of many things that we do at Ford," says Alan. Currently he is working in the data science arena, including optimizing the supplier footprint, helping racing teams move around the track faster, and with the self-driving vehicles that require the creativity and problem-solving that the MathMINDs programs are so great at developing. Clarenceville School District’s mission is to provide individuals a variety of educational opportunities that enable students to become lifelong learners and productive members of a changing world. Both Botsford Elementary and Grandview Elementary are ST Math grantee schools that value family engagement in their students’ learning. 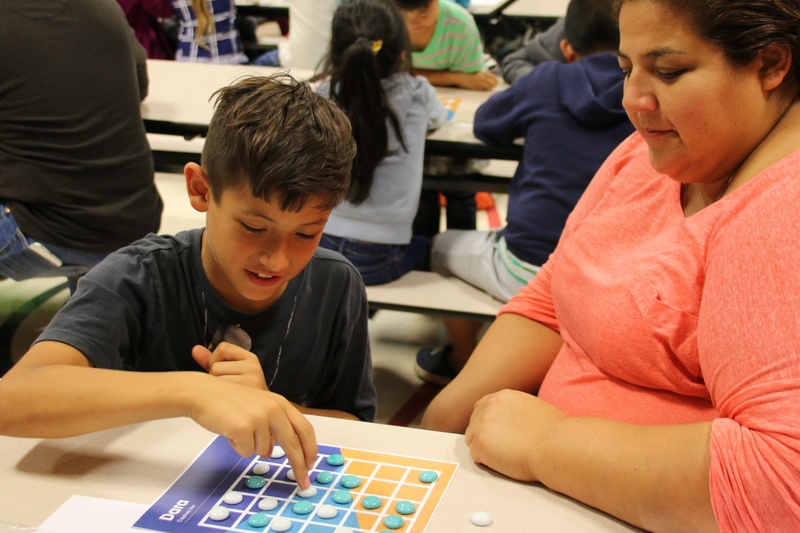 Family Math Night is one way that schools can bring interactive learning opportunities through problem-solving not just to students, but their entire families. Student strategizes about his next moves in the game Dara. Family Math Night’s ancient math games include Achi, Dara, and Gulugufe, as well as other games for young learners through the Lil’ Mathematicians activities. These games help players develop strategy, multi-step thinking and spatial reasoning. Plus, they’re fun and rewarding! What kid doesn’t want to beat their parent at a game, winning through strategic-thinking? One parent enjoyed “playing the games with my daughter and watching her attempt strategies to win!” Her daughter won that game and I think the entire community won in the end. Shift cultural perceptions of math from being scary and frustrating to exciting and essential. Engage communities and students with fun, hands-on mathematical experiences. 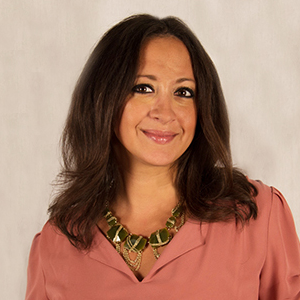 Empower problem solvers and close the experience gap. We couldn’t have said it better than Wendy: thank you to everyone who helped bring this program to a deserving community! Volunteers from Ford Motor Company and Clarenceville School District helped make Family Math Night possible.